Casella Waste Systems is changing how people think about waste. Another company goal is to empower all employees to be great. How does a business redefine its industry, empower its employees and make money all at the same time? To get there, John Casella, chairman and CEO of Casella Waste Systems, fully supported Joe’s efforts to empower employees starting with values. Using a strategic planning process, the company decided upon basic company values such as “Service” “Constant Improvement”, and “Responsibility”. 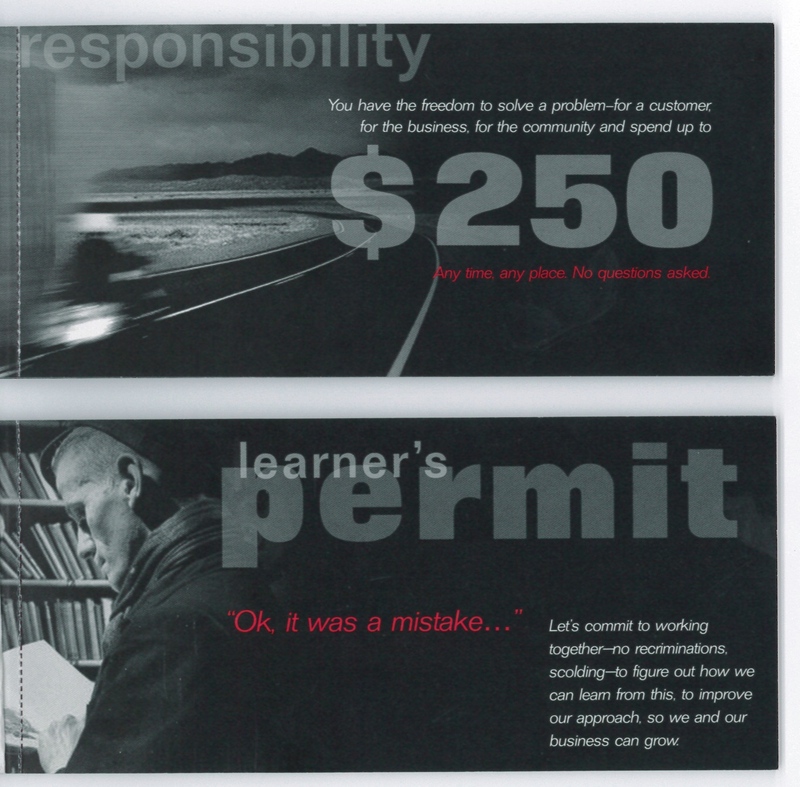 To deepen the business‘ commitment, coupon books were printed (see below), empowering employees to explore and use these values. A Constant Improvement Coupon, for example, allowed an employee to fix any problem for a customer or the community up to $250. The initial reaction from the CFO ”bordered on panic”, however the actual change for the bottom line was positive. “Getting people in the company talking about values gets them to talking about the future. It facilitates our business leading the evolution of the waste industry,” noted Joe. Fifteen years ago, the waste industry was in crisis, similar to where the publishing industry is today in 2011. Redefining “waste” as “resources”, Casella led the evolution of the industry. “It is about organizational change,” Joe reflected. “It was an industry making money by filling landfills. The new paradigm is to think of waste as a resource. Recycling is a relatively new industry. We now have farmers using organic digesters to create energy, an entire new industry for them. Joe studied with, and now partners with, the Bell Leadership Institute in Chapel Hill, North Carolina. His goal question for Casella’s leaders: “How great are you at making the people around you great at solving problems? An employee’s job is to solve the problems of our customers. . .thus we need to enable employees to be great. Mission Every day we help create better people, businesses and communities by helping them to protect and enhance our environment and natural resources. Vision Our long-term vision is to build a highly sustainable and profitable company by transforming traditional solid waste streams into renewable resources. Integrity. We thrive when we do the right thing. We believe there are enduring principles for everything we do and we strive, in our deeds, to meet or exceed those standards. Innovation. We prosper when we learn, understand and improve. We invest deeply in creativity, autonomy and the willingness to take risks and embrace change. We look for opportunities to improve everything we do, from our everyday operations to reinventing the way the world manages its resources. Service. We win when we help others. We are willing servants. We are sensitive to needs and are eager to be a resource to everyone around us, being generous with our time, talent and energy. Teamwork. We’re more effective when we work together. Our impact is consistently stronger when we respect, support and view each other as partners and value our diversity of backgrounds, insights and opinions. Responsibility. We succeed when we balance our freedom to act with a sense of accountability. Our work bears the greatest fruit when exercised within a framework of disciplined boundaries, and with an urgent sense of purpose and ownership. Trust. We excel when we assume the best in each other. Mutual respect and an open, honest environment mark our interactions with others. We acknowledge each other’s contributions, we practice active listening, and we deliver on our promises.